A private, all-boys Catholic high school is dropping the state Regents curriculum. WBFO's senior reporter Eileen Buckley says St. Joseph's Collegiate Institute in Tonawanda will be phasing out the use of Regents exams. Inside St. Joe's High School in Kenmore. WBFO's senior reporter Eileen Buckley says St. Joseph's Collegiate Institute in Kenmore will be phasing out the use of Regents exams. "I've received dozens of emails – all positive about the change. I think people are really excited,” said Chris Fulco, St. Joe’s president. After a three-year evaluation by a Teaching and Learning Committee, school leadership decided to end Regents at St. Joe's. Fulco tells WBFO News it's time to walk away from the Regents and allow students to participate in a more dynamic learning to better prepare them for college. 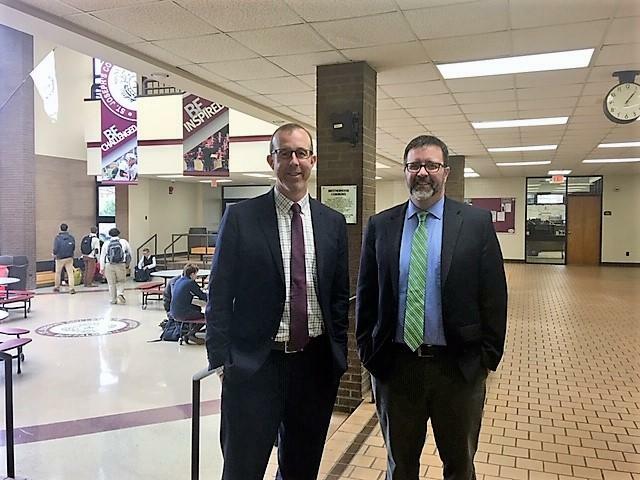 Chris Fulco, president & James Spillman, principal. “Students are being assessed by doing rather than by sitting in a desk, bubbling in circles. They’re doing labs, they’re writing papers, they’re doing independent studies, they’re doing internships, they’re creating rather than just regurgitating and so I think this is really a unique opportunity for us to mimic what’s happening on the college level,” remarked Fulco. “The feedback we heard has been overwhelming positive,” replied James Spillman, St. Joe's principal. Spillman said this will provide more freedom for how they will assess student learning. But it does not mean academics will be easier. “It’s certainly not going to decrease the rigor of our program. It should actually increase that. I think our students are going to be challenged in some new and different ways and our teachers are going to be challenged in some new and different ways too, but I think we are all ready for that,” noted Spillman. This was the first major decision made by Principal Spillman and President Fulco. They both began their new jobs just months ago. Spillman is a '95-graduate of St. Joe's. The phase out begins next school year. All incoming freshmen and sophomores will not take Regents exams. By the 2020-21 school year, Regents will no longer be offered at St. Joe's. Other area private high schools including Canisius High School, Nardin Academy, Nichols School, The Park School of Buffalo, The Gow School and Buffalo Seminary do not follow a Regents program. St. Joseph’s Collegiate Institute in Kenmore has completed a “record-breaking” capital campaign. The school raised more than $20 million over the last five years. The campaign was to build the school’s endowment and strengthen its ability to provide needed financial aid and scholarships. And it is a successful end for the longtime leader of the school. Friday is president Robert Scott’s last day on the job. WBFO’s senior reporter Eileen Buckley says talks to Robert Scott about his career. A special celebration was held at St. Joseph's Collegiate Institute Tuesday to honor the founder of the school. If you drive by the school on Kenmore Avenue in Kenmore you will see a large, bronze statue of Saint John Baptist de La Salle. WBFO's Eileen Buckley says St. Joe's has a new bronze statue to honor its founder.